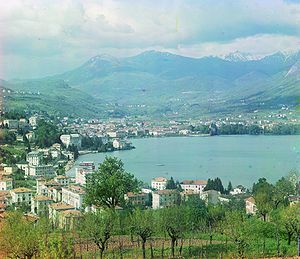 ‘S e baile mòr ann an ceann a deas na h-Eilbheis a th’ ann am Lugano (Gearmailtis: Lauis, Laideann: Luganum, Lombard: Lügàn, Rumantsch: Ligiaun). Chaidh am baile a chlàradh airson a’ chiad turas ann an 724, ged an robh daoine a’ fuireach an seo o shean. Thathar dhen bheachd gur e ainm Ceilteach a th’ann, bhon fhacal Lug, Dia an uisge, neo fiù’s bhon Laideann lucus (coillte). Tha e suidhichte aig 315m os cionn ìre na mara ri bruaich Loch Lugano, anns an roinn (Eadailtis: Cantone) Ticino, 154km air falbh bho Zürich, 216km bho Ghenève agus 156Km bho Bhern, prìomh-bhaile na dùthcha. Tha 54,667 duine a’ fuireach anns a’ bhaile, an 9mh baile na dùthcha a-rèir àireamh-sluaigh. ‘S e Eadailtis an cànan a tha aig a’ mhòr-chuid dhe na daoine ann an Lugano. Giovanni Battista Discepoli (1590 – 1660): Dealbhadair. Mario Comensoli (1922 – 1993): Dealbhadair. Mattia Bonetti (1954): Dealbhadair chamara. Air a tharraing à "https://gd.wikipedia.org/w/index.php?title=Lugano&oldid=497449"